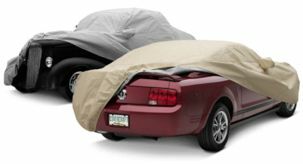 Sun, snow, rain, or sleet - when it comes to superior and affordable outdoor protection, the MaxTech Car Cover gives you the most for your dollar! Features four layers of protection, front and rear elastic, custom fit mirror pockets, non-scratch tie-down grommets, and comes complete with storage bag, cable, and cable lock.Blocks out moisture, dirt, and pollutants while letting air pass through! Comes in an attractive gray finish.